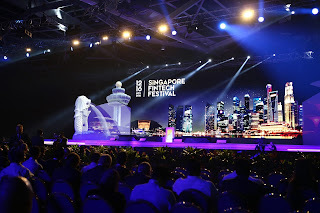 Just back from a splendid week in hot, sticky & smart Singapore and the FinTech Festival. I took in as many Innovation Labs as I could, talked to umpteen start-ups and met splendid developers. I saw the Eight Essential Technologies* in action & gained some sense of what’s here and what’s coming. The new port will be a ‘Smart’ port, with digital technology, sensors, automated cranes, driverless vehicles, drones to inspect equipment, and a smart grid. The goal is seamless and efficient port clearance and a 50% cut in turnaround times – (already best in class). Meanwhile, Maersk and other shipping companies are using Blockchain to create seamless and efficient flow of goods around the world. One focus area is Trade Finance. The goal is to make a complex, wasteful, error-laden process involving multiple actors (buyer, seller, intermediaries, multiple banks, regulators and insurers) – virtually instantaneous. FinTech’s effect on people will likely be even more profound. The numbers and implications are awe-inspiring: innumerable people in innumerable small villages across a vast sub-continent will have better lives. Now they can get paid directly, securely grow their savings, qualify for small loans, insurance and healthcare. Less waste and hassle; more dignity and choice. Here’s a deep bow to all the fine people I’ve met. Looking forward to getting to know you all better! Bravo Singapore!